Summer in Mississauga was packed full of fun thanks to the Art Gallery of Mississauga. I've got the photos to prove it! The Toronto Church of Craft and the Spinners and Weavers Guild work with participants to transform the street into a work of craft. Kareem from Grace N Style works with the audience to demonstrate Jessica Thompson's wearable art, the Freestyle SoundKit. Toronto collective LAL perform, delivering futuristic rhythms melting into warm basslines with hints of South Asian roots and hip hop formations. Mississauga welcomed Syracuse, New York artist, Christina Kolizsavary with a clothing swap. Particpants got to clean out their closets and take home great new wardrobe pieces! Lunch, a tour and discussion with curators and artists on Sunday, July 27. Here participants are enjoying coversation inside Adrian Blackwell's Model for a Public Space. 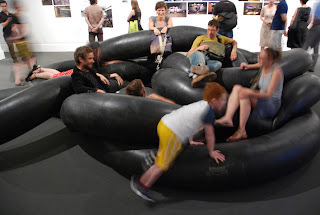 Visitors to the Gallery, during Adrian Blackwell's Models for Public Spaces exhibition, interacted with Monster Coil. Radiant City was screened during the exhibition with the Coil as a comfy seating arrangment.